The race is winding down, at least for the top spots, as we have 11 guilds passing the finish line as of today. The rankings are pretty interesting as we have four Asia server guilds, with Alpha leading the pack, only one fewer than the usual dominant force in these races, with the EU claiming five. 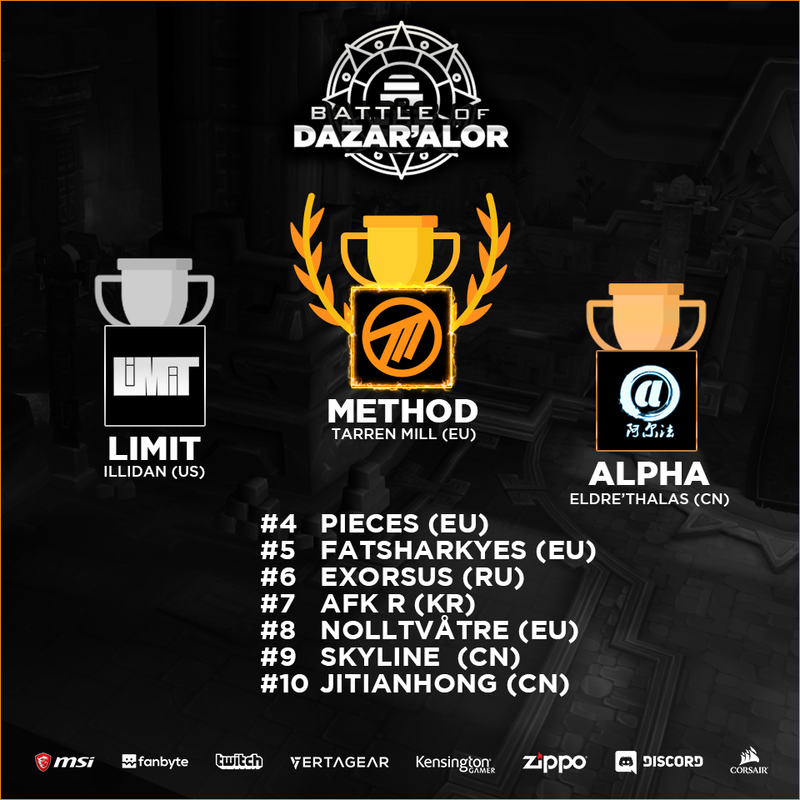 Limit are the only US/OC guild to have secured a place up here, while Aversion just missed out on the top honors and finished up in 11th place. We also have some videos to share, both for Alpha's World 3rd and Pieces World 4th, with both guilds sporting some impressive nerdscreams at the end there. That's going to be it for our coverage of the Battle of Dazar'alor race, and it was a damn good one to be sure. Whether the next raid, the Crucible of Storms will even be a race, with only two bosses available, remains to be seen, but we'll definitely be checking in to take a look at some of the kill videos at the very least. In any case, we'll see you next time! If you want to check out all our coverage for this particular race, you can head on over to the hub as well.